I know several men who like sartorial clothing but want to bring it down to their more personal (and usually more casual) level. They get bespoke. They understand it. But a suit and tie is rarely needed, perhaps even appropriate. There are several options I would suggest, including the more casual suit cloths (flannel, cashmere, linen, tweed), perhaps as jackets. But my all-time favourite is the chambray shirt. Most popularly seen as just a lightweight denim, chambray really only requires a coloured warp and a white weft. It doesn’t even need to be in cotton, let alone indigo; but it is usually both. More importantly, it adds a casual, even workwear element to an outfit without having to resort to quirky pattern or colour. Although the darker colour doubtless adds to its informal effect, it is the texture that is key. As with the jacket materials mentioned above, it generates its less formal nature by substituting the expected smooth, sharp cloth with something a little fuzzier, nubbier. Texture is usually a more sophisticated twist than pattern or colour. A failure to understand that has led to men buying shirts with coloured buttonholes, flowery inner collars and cuffs with coloured binding. There is a much more mature way to express yourself. 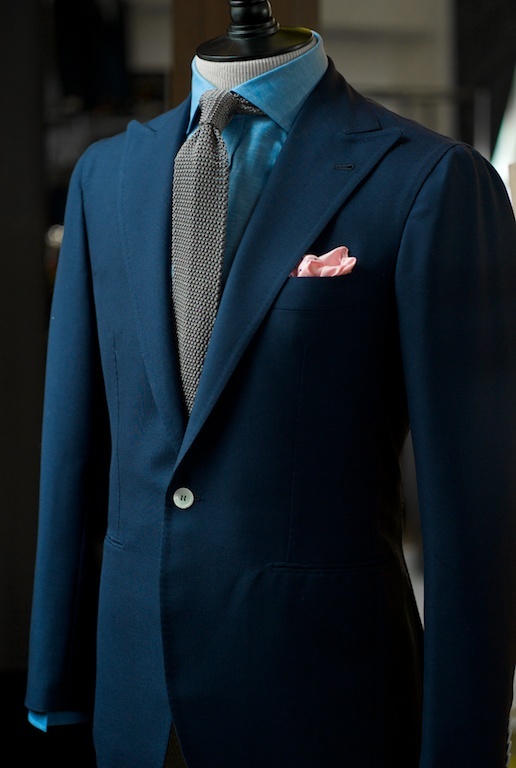 If you do want to experiment with colour and pattern, keep it dark and subtle, as in the great example above. This may look like pretty straight, prep-inspired Ralph Lauren, but the effective combination of all those textures is very hard to achieve. Here it is the deep red shirt that makes it for me – if it were a plain, smart blue the effect would be ruined. That and the tie would be too smart together. The other pictures here are from The Armoury’s tumblr of images, which is simply the greatest source of inspiration I’ve found for years. Ethan, pictured top, is particularly good on texture combinations. And the picture below illustrates that other cotton textures can also work well – linen, or even a linen mix. You can follow the discussion on Chambray shirts: the best twist on classic dress by entering your email address in the box below. You will then receive an email every time a new comment is added. These will also contain a link to a page where you can stop the alerts, and remove all of your related data from the site. I love the chambray in the top photo. Do you have any suggestions for chambray shirting (other than Simonnot Godard)? I find really interesting your way of envisioning how to compose a smart casual outfit.This topic seems to me to be the tricker in the whole menswear. Indeed, a suit is somehow a uniform, even though at this level one can see whether there is style, elegance or “chic”, as the French would say, behind and expressed by a man wearing it. But, and to be up front, I have come to think that the real litmus test for real elegance in menswear is in the area smart casual. If one is having a shirt made to measure, is chambray too casual for double cuffs? (Worn with very simple non-bling silver links.) Thanks. Hello Simon. I’ve been following your blog for the last two years and find it helpful and entertaining. 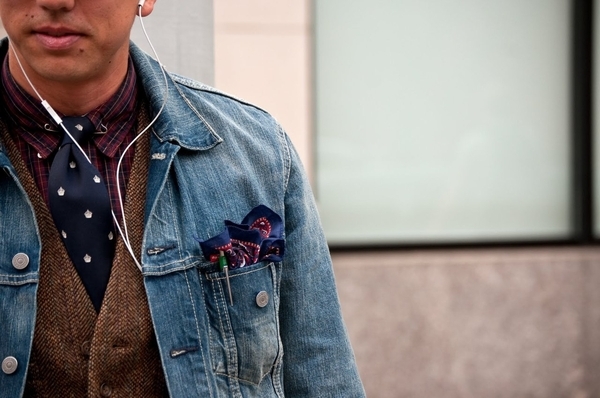 About the chambray shirt… would you please suggest me an online store in which I can find nice chambray shirts? Photo 1 is reversed – buttons on wrong side – taken in a mirror? 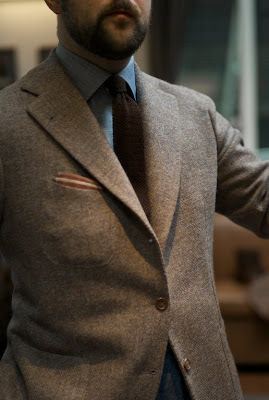 I find my Chambray shirt (Simonnot Godard cloth, bespoke) not very pleasant to wear. It has a dry feel and the fabric is quite stiff. Also, it is more difficult to iron than other fabrics. What’s the difference between chambray and end-on-end broadcloth? They seem very similar, except that chambray seems to have more gloss, and generally seems more casual (I’ve often seen end-on-end dress shirts worn in pretty formal contexts). after buying light blue shirts and white shirts (also a few in light grey) for years to wear with suits (and being happy with it), I realised that my wardrobe has become a little bit uniform, not to say boring – especially because I avoided patterns and stripes für so long. Despite having realised this months ago, I cannot bring myself to buy a striped shirt or one with patterns, mostly fearing it would clash with the ties I own. Could you recommend a certain type of ties (or a few) to go well with striped or (reasonably) patterned shirts? – There are many types of shirt collars – would you attribute them to typical settings/combinations/situations? – What about shirts with dark colours (combinations/situation)? and thank you for all the provided knowledge/experience! There are a few posts on the site about shirts and ties worn together. They’re worth a look. Essentially, a solid colour tie will always be good with a pattern, and any pattern in a tie that is substantially different to the pattern of the shirt underneath it. Collars are a big area and I’ll write something separate on them. For shirts in dark colours, look up my posts on grey shirts in particular. After reading PS nearly daily (and skipping over most other menswear sites) for a long time it seems to me there is only one (nearly) blind spot: the shirt collar. There is some information of course, but nothing comparable to the very specific and helpful advice on lapels for example. So I am very much looking forward to anything you plan to write about it. Instantly I found your post “Combining pattern and colour in shirts and ties” which I recommend to other readers and which I was obviously was too lazy to search for. When I wrote “shirts with dark colours” I thought of really dark colours like navy, charcoal, black. Of course they would not be formal enough to accompany a business suit. But I can’t even remember wearing my only navy shirt at informal occasions more than twice in the last five years, and only once with an odd jacket (and jeans). No answer needed, just for your information. Hey simon, i bought a drake’s blue chambray shirt (https://www.drakes.com/shirts/button-down-shirts/blue-denim-cotton-shirt-with-button-down-collar) and didn’t quite expect the shirt to be so dark and would prefer something lighter in shade. Would it fade with washing, and eventually reach a very light blue like denim? Safest to check with them, but no I wouldn’t expect it to fade – certainly not the body. The most you’d get is a little around the seams.